by Stephen Qualtrough of Liverpool Feb 2012. The title is taken from a sign that a newspaper vendor had displayed in Lime Street Station when I went there with my father, John qualtrough to visit London in 1964. It was the summer holidays in Halewood. Unless you took a 15 minute bus ride to Woolton (and the shops, baths or cinema), there was nothing much to do. I watched a bad spoof of 'Dr Who' and thought that, as a fan, I could, and would, write a better one myself, and so I did! In my version, instead of the Daleks invading London, they had invaded Liverpool, made a bee-line for the 'Cavern', appeared on stage and caused the all-girl audience to scream! Because of this, the 'Cavern management had promptly rebooked them for another engagement! from 21 November to 26 December 1964. I also spoofed the recent 'Marco Polo' episodes. This was an excuse for a lot of old jokes as it was 1300. The jokes had only just been invented then!! I sent my little play up to a TV series called "Junior Points of View", expecting little or no response, (other than maybe a heavy knocking on the door to give me a thrashing). Imagine my surprise when we were asked to phone the BBC and 'reverse the charges'. Soon a letter arrived to organise a trip to London courtesy of the BBC. On December Thursday 3rd 1964 my father and I passed the newspaper vendor and took the 10:15 from Liverpool Lime Street Station to London. The train stopped at Euston Station and a car was there to take us to BBC television Centre. The driver chatted away as we sped through the London Streets. We went through Paddington Green, noted for the well known music hall song "Polly Parkins" who was as "proud as a Queen" and came from that location. When we stopped at some traffic lights, I spotted a young man dressed strangely in a heavy coat and what looked like clogs. Maybe he was a fore-runner of the about-to-happen London fashion scene. He was stomping his feet as he stood at the bus stop, it was so bitterly cold. A placard above him anounced the forthcoming arrival of "2001, a film by Stanley Kubrick". It must have taken Kubrick years to do the special effects (literally) as the film did not hit the cinemas until much later on in the decade. Maybe I was basking in the reflected glory of the all-conquering Beatles as just that week they had entered the UK hit parade for what seemed the umpteenth time with "I Feel Fine". Wood Lane was the biggest 'lane' I had ever seen in my life. It made Halewood's Wood Road look weeny. A recording of 'Juniors Point of View' was about to begin on Floor 4. There ahead was the iconic London BBC TV Centre. 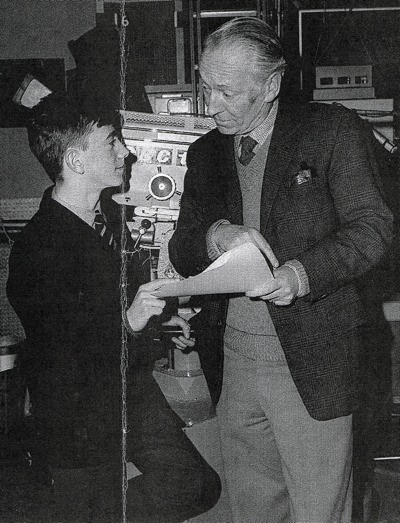 I was taken to the recording studio and had a chat with Jack Bond, the producer, who explained that we would be expecting an appearance by William Hartwell after the recording. I was star-struck at seeing Sarah Ward the presenter and did not really take the information in. 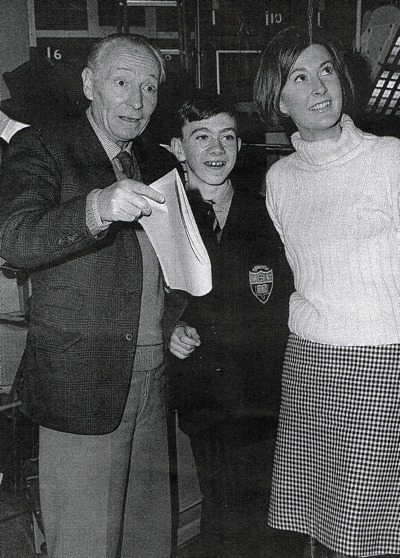 William Hartwall (The first Doctor Who), 12 year old Stephen Qualtrough of Liverpool and Sarah Ward, host of the BBC's 'Junior Points of View' program in 1964. Sarah was the host of this ten minute show from 1964 until 1967 and 1970, and a BBC TV announcer from 1965 until 1966. The show was on before the 6 o'clock news on Friday nights. There was a separate section to one side, away from the recording machinery. There was a weather map. I recognized it as the captioned still of the UK that came in to view when the news ended. It had white letters on it spelling out 'FOG' or 'SNOW', or whatever over various British locations each night. I never realised that these were like scrabble letters. Two young men with a teenage like appearance were arranginging these ready for the night's broadcast. I never realised that the caption was so small. I had always imagined it as a huge wall chart hanging there in the studio. 'Junior Points of View' was a show that us kids could write into to say what we thought of BBC and 1TV output. It was 'no holds barred'. We said what we liked! Sarah Ward was very professional. She read out the sometimes defensive comments as a link between the letters. The selected mail had been photographed and enlarged. Actors on tape 'read out' the recorded soundtrack to these photographs whilst the camera zoomed in on them. For a 10 minute show you would have thought that what was being recorded - on the early 60s prototype of the video recorders, we would use pre-DVD for 80s or 90s home taping - was of world importance. The action was frenzied and the show had to be stopped several times. The man on the studio floor barked his commands to Sarah, who repeated her lines between letters. As a regular viewer, sitting there at the back, in full view of the desk where she sat, I could not tell the difference between the 'takes'! Sarah Ward had a much more difficult job than I could have ever imagined when sitting on my couch at home on Friday nights. She remained calm and collected throughout. I thought she did a magnificent job. She was obviously very pressured. When recording was complete, we all moved to BBC-2 studios. On the trip to the bBC I wondered if I would be able to see a Dalek Shell that actors climbed inside, and had to control it to create 'this TV monstor'; or else some sic-fi artefacts from the series. 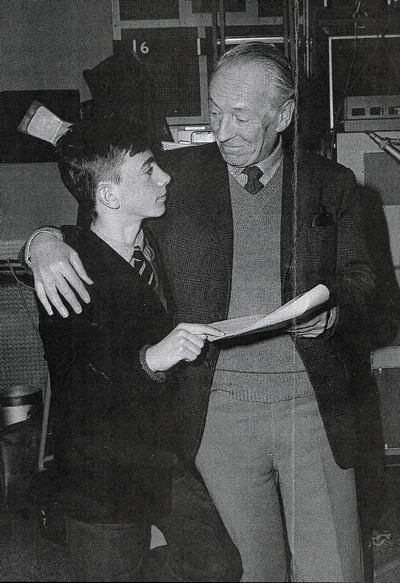 Imagine my surpise when there in the studio, sitting next to Jack Bond was none other than William Hartwell who played 'Doctor Who' himself! 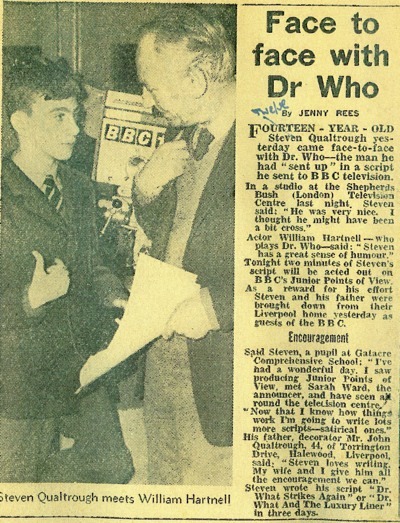 Jack also produced the adult version of this 'junior show' and was talking about a recent letter he had received concerning 'Tales of the Ray'. This was a Sunday night series chronicling Rudyard Kipling's 'Tales of the Indian Sub-continent'. Jack was saying: "She has written in to say she was watching the latest episode and even though the show is made in Black and White, she could see that the Indian's turban was blue!" William Hartwell replied drily: "You must write back and ask her what brand of gin she drinks. It must be good stuff!" Some press swarmed in and asked me some searching questions and then I had pictures of myself taken positioned next to William Hartwell and Sarah Ward. One of these has just re-surfaced on Art.com. There are only two pictures of William Hartwell and I am in one of them and mentioned by name as a fan! I was in awe of William Hartwell. He had been a major British film star before the TV series, featuring as the lead in 'Carry on Sergeant', the first of about 20 episodes of 'Carry On' film comedies. He was also in 'This Sporting Life', and the classic version of Graham Greene's 'Brighton Rock' where he appeared next to a baby-faced Richard Attenborough who played in the lead role. I need not have worried, he was very kindly and like a grand-father. He made sure that I would get copies of the photographs sent to me. These promptly arrived some time later. I was greatly impressed by him. 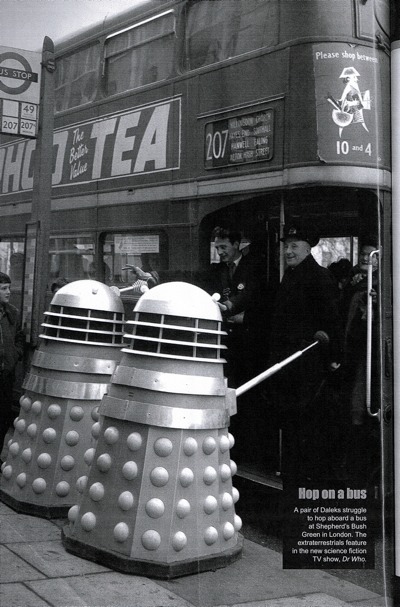 I don't know there the glossy photos have gone, some were on a BBC video called 'Doctor Who, the Beginning' as part of a photo tribute to the first Doctor Who (on one of the 'extras'). Sarah Ward later appeared on a 30 minute 1TV children's show. I remember her reviewing Zeftelli's 'Romeo and Juliet' film, praising the young actors who were considered a controversial choice to play the young lovers. After the session, Sarah Ward said that I had handled the interogators very well, "As if you did it every day." Little did she know. My friend next door used the same cross-questioning techniques on me to gain information on a regular basis! All too soon we were whisked away back to the station. My '15 minutes of fame' were over (to quote Andy Warhol). We travelled home on a British Railway's train that stalled as soon as we pulled in to Rugby Station and we were left stranded in the dark and bitter cold, while we waited for our journey to resume. Back to Earth with a bump! At home, it was soon back to the old school routine. Never mind my favourite science fiction series, there were exams to take and homework to be done. But what a wonderful thing to have happened to a boy of 12!